Storyboard That the excellent learning tool that educators are using in a wide variety of ways (i.e. project based learning, graphic organizers, storyboards/telling, etc.) last week released a free teacher guide for different Thanksgiving activities. These activities are great for telling the story of Thanksgiving, labeling different items, telling what you are "thankful" for and more. Best of all, a teacher can copy the storyboard and use or edit it for creating their own template. 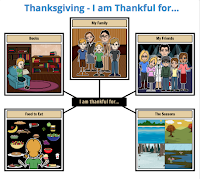 I highly recommend checking out Storyboard That's Thanksgiving activities by clicking here!!! *Storyboard That is an advertiser of Technology Tidbits.